FREDERICTON – The City of Fredericton has issued an Expression of Interest (EOI) for the sale and development of city-owned property located at 203, 209 and 211 Queen Street in the sest end of the city’s downtown. A mix of uses are permitted and encouraged for the site, including commercial and residential projects, as outlined in the City Centre Plan. Any proposed development should include adequate parking to accommodate the needs of the project. The City is selling these properties together to facilitate a single development that may or may not be phased. 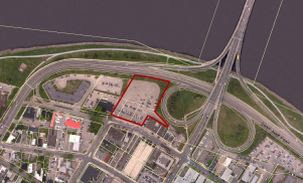 The property has a total lot area of approximately 9,500 square metres (2.3 acres), generally in rectangular shape, with 80 metres of street frontage on Queen Street and a view of the St. John River. A brief summary of information related to soil and flooding conditions is available, but a more detailed analysis will be necessary. The purpose of this EOI process is to canvass interest in the development of the property and to determine a short list of proponents who clearly appreciate and accept the development objectives for the site and who have the capacity to undertake a project that meets these objectives. A short list of proponents will be selected to proceed further. The lowest or any bid will not necessarily be accepted. • the benefits to the community as a result of the development concept and the urban design. Interested parties have until 3 pm on Tuesday, July 12, 2012 to respond. The EOI document, entitled “Expression of Interest (EOI) P12-42: For the Sale and Development of Land in Downtown Fredericton 203, 209, 211 Queen Street”, may be obtained by calling Bob Cormier, Asset Management Manager for the City of Fredericton at 506-460-2082 or via email to bob.cormier@fredericton.ca. For more information about the property, including zoning information, please contact Calvin Thompson, the City’s Real Estate Manager at 506-460-2036 or calvin.thompson@fredericton.ca.